I did an undergrad in drama. While I was doing that I did night classes twice a week in music. Nowhere during my undergrad was the business of creativity ever addressed and since then nothing has changed. After getting my first professional theatre job – one that happened to be produced by business people, I quickly realised that because I was unable to present myself in a way that my employers could understand, I experienced a lot of exploitation. I realised that in order to even the playing field, I would need to learn business. So, using a large chunk of my earnings I went back to university to study a post-grad marketing diploma – which at the time to me felt like a complete 180. It was difficult for me to synthesize my arts conditioning with that of business and marketing, but I’m glad I eventually did. In my year group I was the only ex-arts grad whose aim in studying this course wasn’t to enter the corporate world. But shortly after graduating I too entered it, and I hated it. Not because there’s anything inherently wrong with working in the office, but because it was in-congruent with what I really wanted to do. I did it because the prevailing narrative at the time was for me to get a Real Job. I love the arts and have subsequently learnt to love business too – the two are not mutually exclusive and I know that a key part of solving the problems in broken creative industries is to marry the two disciplines. One cannot exist without the other. Since I’ve put the two together my perspective on a future in the arts is a lot more positive and hopeful and I have no interest in complaining about the arts this, the arts that. That narrative is the reason why things appear the way they appear, but it is not beyond solving. Are you a musician, actor, writer, dancer, designer or freelance creative pro? Tired of people telling you to get a Real Job? 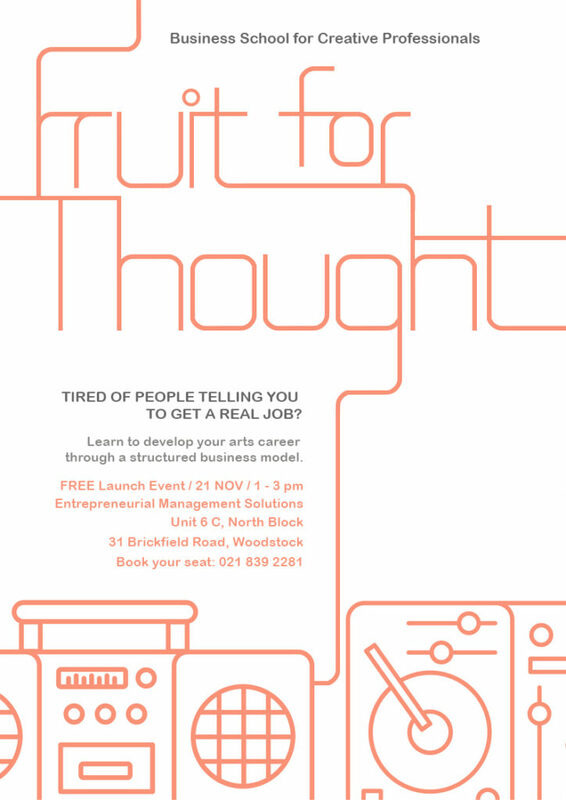 In collaboration with Entrepreneurial Management Solutions, Fruit for Thought: Business School for Creative Professionals will teach you how to develop your arts career through a structured business model and share your fruit. Monthly sessions held at the Entrepreneur and Management Solutions offices in Woodstock, Cape Town cover both practical and theoretical issues related to developing your business. Each session will give you real take home and implementable tools that can be applied the very same day. Join us for a FREE launch /21 November/1-3pm at Entrepreneurial Management Solutions Unit 6C, North Block, 31 Brickfield Rd, Woodstock.